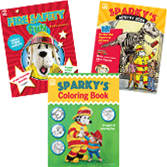 Get kids barking about fire safety with Sparky®'s most popular learning tools! Save 15% on the NEW 90-piece Sparky's Coloring & Activity Books Value Pack. Bow-wow! Here's an economical way to share Sparky the Fire Dog®'s lifesaving messages with children throughout your community, from preschool through Grade 2. NFPA®'s new Value Pack stretches your budget and extends your outreach in schools and community events. It's a smart choice for fire safety educators during Fire Prevention Week™ and all year long. Receive 90 items for as low as 63 cents apiece with Sparky's Coloring & Activity Books Value Pack!